Has anyone else noticed how high the price of beef has become? I definitely have and it has changed the way that my family eats. Before beef prices started to rise I had already started to cut down on the amount of beef my family consumes and switch to more beans and vegetarian dishes. When the prices increased it further drove me to limit beef to once a week at most and add more chicken and fish. As anyone that reads this blog regularly knows my family still loves pork, but we have even started to limit our consumption of this favorite meat. Now I make sure that the pork recipes that I prepare make more than one meal and that the pork is an ingredient rather than the main component. I was pleased when the December issue of All You magazine had a recipe for pork and beans which only cost 2.84 per serving and made enough for two meals for my family of four. This recipe has 8 ingredients. It takes 20 minutes of prep and 5 hours and 15 minutes of cooking and makes 8 servings. I had no problems finding any of the ingredients at my local grocery store. 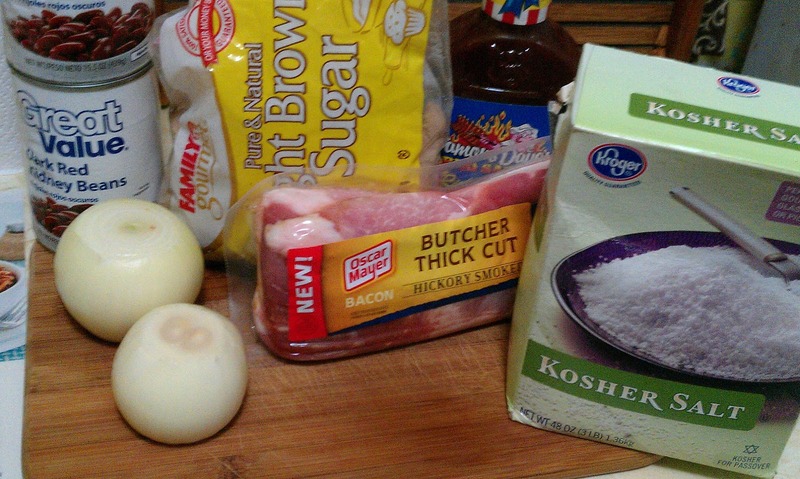 For the onions I used sweet onions since they are in season and thick cut bacon, a family favorite. For the bbq sauce I chose to use a slightly more flavorful sauce which made the pork and beans have a less sweet taste. I like that you could change the bbq sauce in the recipe to increase or decrease the sweetness and change the overall flavor. I followed the remainder of the recipe as written. As everyone knows I love slow-cooker recipes. This recipe was very easy to prep, with the crockpot doing most of the work. I would suggest browning the pork before placing it in the crockpot. I always make sure that any meat that I am putting into the crockpot is fully braised before going in. It helps to keep the meat moist and flavorful while cooking. Overall, another easy crockpot recipe with 40 grams of protein and 6 grams of fiber per serving. For the recipe go to Pork and Beans. I'm glad that you found some recipes that you like! As for toddlers, I had one of my son's that was picky during that stage and one that wasn't. For both of my kids, pasta was a great option, it's easy to cut into small pieces and is a great finger food. Love your blog! Thanks so much for stopping by and following. I know it's not easy having to suffer through panic attacks. I am now a follower. Thanks :) I hope you come back again and find some recipes to try! I now really want to to try this recipe. I've searched everywhere for a good pork and beans recipe. Thank you! "...that the pork is an ingredient rather than the main component." Amen! Pork is a very rich meat and is much better for us in small amounts. Crock pot recipes are my favorite and I'm sure my husband and friends will love it! Thanks, Frugal! Pork was on sale so I got to try this recipe out! I went with a less sweet BBQ sauce, too and it was perfect. Thanks, Frugal!